I must admit these muffins are not the prettiest boys in town. But don't be deceived by the looks: they are absolutely delicious. I got quite ambitious when I realized their potential and have been playing around with the ingredients for some time (please read: my family is totally overdosed on them as they were being served daily for about 2 weeks in a row). My main source for the slight changes being made in the recipe was my favorite cookbook The Flavor Bible. It is an amazing book, actually more a reference book than a cookbook as it does not contain recipes but lists all sorts of foods and basic ingredients in alphabetical order and their matching flavors. 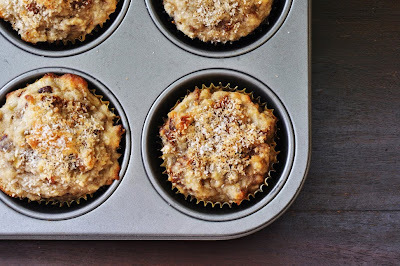 For this muffin recipe I have been reading the banana and coconut sections over and over again. Now here is the result: a vegan muffin sweetened with bananas and dried figs supported by the mild flavor of coconut. Very little flour and no sugar needed. A perfectly healthy muffin that's good enough to have for breakfast. Preheat oven to 180C. Line muffins tins with paper liners. In a bowl, combine all flour, salt, baking powder and coconut flakes. In another bowl, stir together bananas, coconut milk, oil and vanilla extract. Combine wet and dry ingredients. Stir in the dried figs. Fill batter into muffin tin. Top each muffin with half a teaspoon of brown sugar and half a tablespoon of coconut flakes. Bake for 25 minutes or until golden brown and toothpick comes out clean.